In a week that ended on a high for Tipp Ladies Football there was further good news in Cahir to start the week with the announcement of the Tidy Towns results. 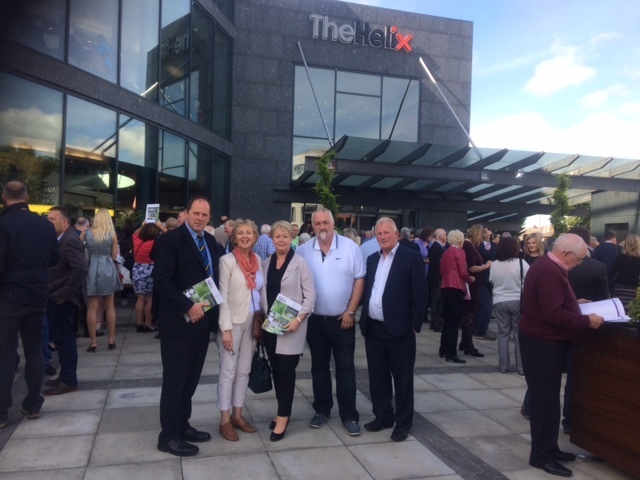 The Helix was the venue and the Cahir Group received a Bronze Medal for the first time in their history. Speaking to Cahir News, Cllr Andy Moloney said it had been a fabulous result and he was thrilled for everyone involved. It's not just those you see out on the ground presently but the many people who have kept the flag flying since its foundation in the 60s. We have people who have donated materials, machinery, money, plants and paint over the years. We have residents groups, community groups, disability groups, schools and many individuals tipping away on their own and I am thrilled for them. This victory is not only about the lads you see out on the street but the many people you don't see in the background or out on the outskirts. These people contribute enormously to their community and work away without any fuss. Business have played their part in painting their premises and putting up baskets, visitor numbers improve in a Medal Town so we must now move to the next level. This will only be achieved with a team effort and we can do that in Cahir. Moloney singled out the local council for their continued support. Our local awards are on in the Shamrock Lounge on Saturday 7th October at 8.15pm. We would love to see everyone there on the night as this year was an open judging system and many awards on the evening. Finally, Cllr Moloney thanked the current committee and media sources who promote our activities on a weekly basis and that they meet as normal on Wednesday night.